There are times where a simple trunk bag won't do. Now, you could spend $30 on a Swagman Whee Pod or even $100 or so on a Otivia CargoCache trunk and have yourself a good quality lockable bike box, but there are a lot of inexpensive, water-resistant plastic boxes that appear to be made for going on the back of a bike but can't. Boxes such as, for instance, the Plano 1412 Marine Box. For barely $17, I bought a 15" x 8" x 6.25" box of orange goodness. Here it is, just resting on the rear rack of my office bike. It just looks at home there, and the bright orange color means it'll be highly visible in traffic. Even though I had recently improved my trunk box with a custom made taillight I didn't want to have to swap it out from one bike to another all the time. As large as the black box looks, it isn't that heavy and provides a spacious waterproof compartment for gear. It is particularly useful during the Five Boro Bike Tour to keep your half-eaten oatmeal cookie and souvineer T-shirt or bike jersey from being stolen or rained on. Now the hardware you see between the two boxes are what gives the one on the right its value: the screws go in through the shiny silver-colored brackets through the box and underneath the rack where they screw into the black pieces of hardware. While one may be wary when leaving a bag with all your valuables on your bike accessible to thieves with knowledge of Velcro, the lockable trunk box is the peace-of-mind alternative. So, to make the Plano box work like the other one, I'd have to drill four holes in the box and then replicate the four pieces of hardware. 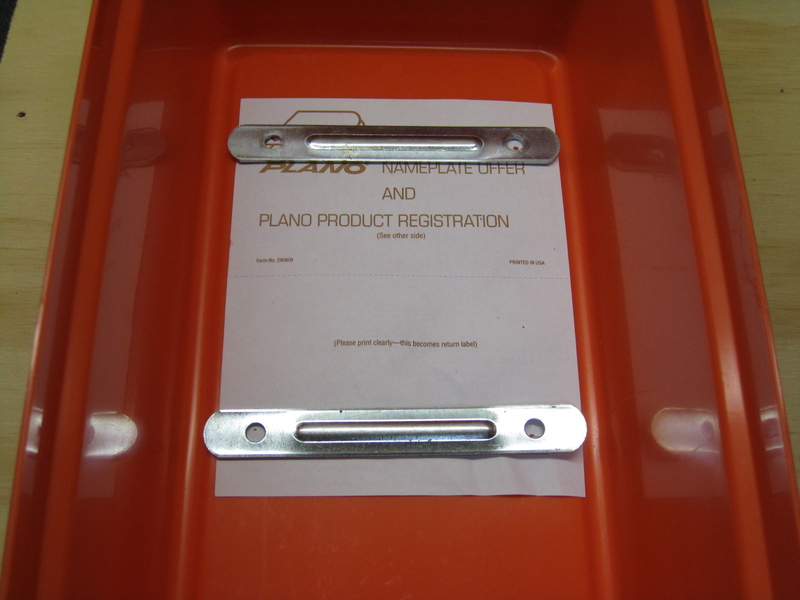 The first step was easy: I used the 'nameplate offer and product registration' sheet that had come with the plano box as a template so I'd know where the holes should go. Next, I found a long piece of flat steel and used a Sharpie to mark where it needed to be cut so I'd have four near-identical pieces of metal. Replicating the pieces above was easy with my 12" Ryobi Drill Press. Now came the challenging part: replicating the bottom pieces. This would be easy if I knew where my tap-and-die set was (actually, I'm not even 100% sure I have one). Since I was out of luck, I needed to improvise. I noticed the upper pieces got hot when I used the drill press on them to make the holes, so I thought I'd drill the holes for the bottom pieces. 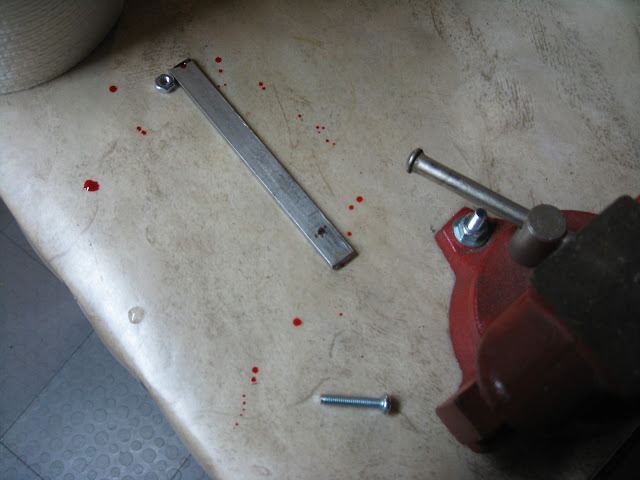 Then, using gloves, I'd quickly move the piece over to the bench vise so I could use an impact driver to force a bolt in, thereby threading the metal. 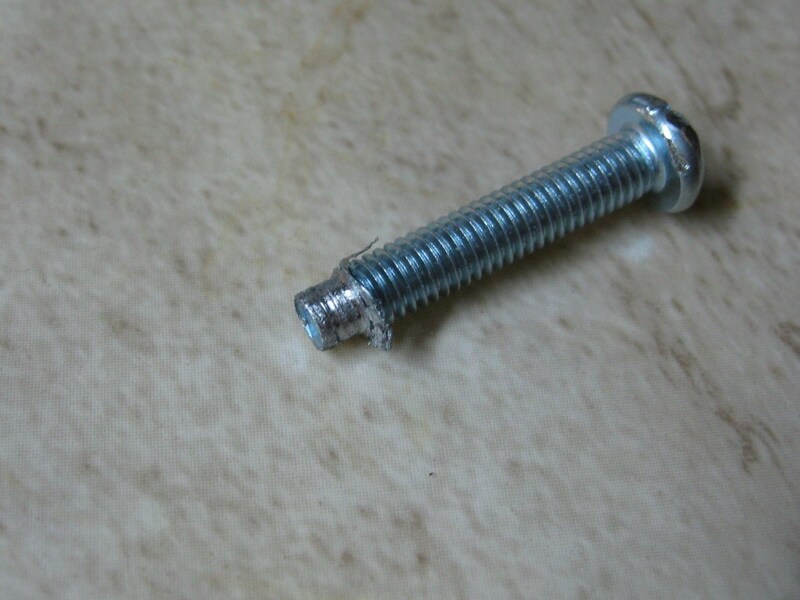 After pulling the damaged bolt out with a pair of vice grips, I decided to wait until the metal had cooled, and then I would balance a new bolt over the hole with the thumb and index finger of my left hand while pushing the bolt in hard with a low-speed power screwdriver with my right hand. That also didn't go well. After I washed the cut on my thumb with hot water and applied bacitracin and a Band-Aid, I cleaned up the mess and decided a new approach was necessary. I returned to the drill press and made the holes bigger than the bolts that were going to go in them, but smaller than the nuts that had come with the bolts. I went into my welding room and plugged in the Lincoln Electric PowerMIG 140c and my exhaust fan. Then I secured the work to the welding table. Next, I put on the welding shirt, welding gloves and welding mask. My plan was to center the nuts over the openings in the steel and then quickly but delicately depress the trigger. I knew by experience that it was incredibly easy to melt steel, and seeing that these nuts were barely the size of my pinky's fingernail, I'd have to be careful. I placed a clamp on the first nut, put the wire against it, and carefully pulled the trigger. 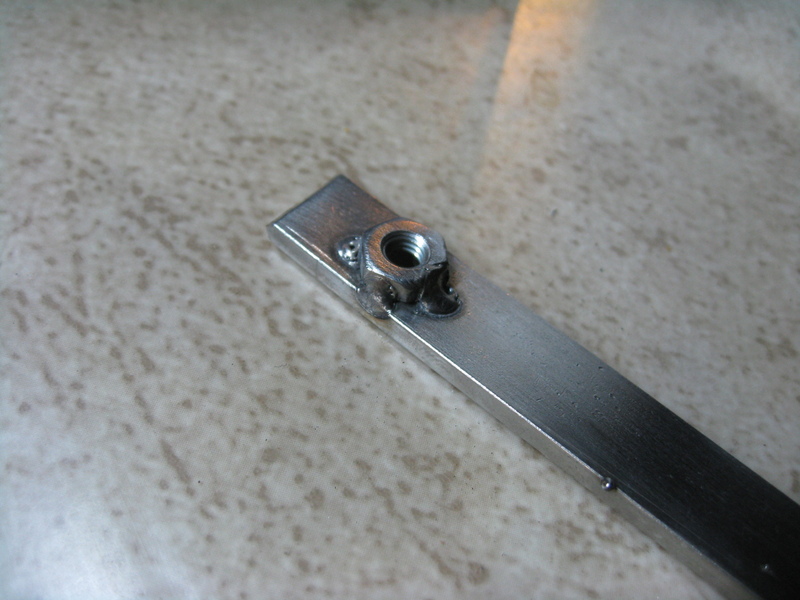 It may have been overkill, but each of the four nuts got at least three tiny welds to attach them to the steel. Once everything cooled down, I had my brackets and I was ready to put it all together. It's excellent, and was worth the cut on my left thumb (it's better now). It's so sturdy when attached to a rear rack you can actually pick the whole bike up by using the handle on the Plano box. Even though I didn't take advantave of Plano's nameplate offer, I decided to personalize the box my way. And since the 18-letter 'Bikeshop Playground' wouldn't fit, I had to come up with something shorter. 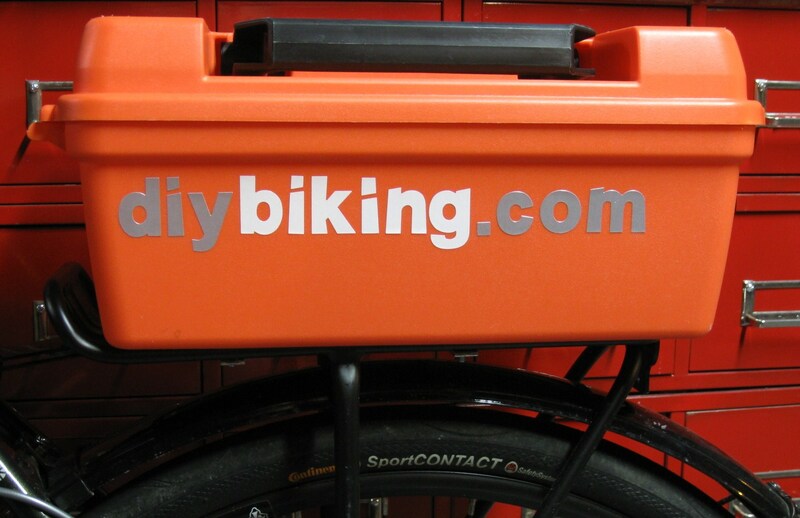 Tell your friends about DIYBiking. It has all the fun of Bikeshop Playground with half the letters. 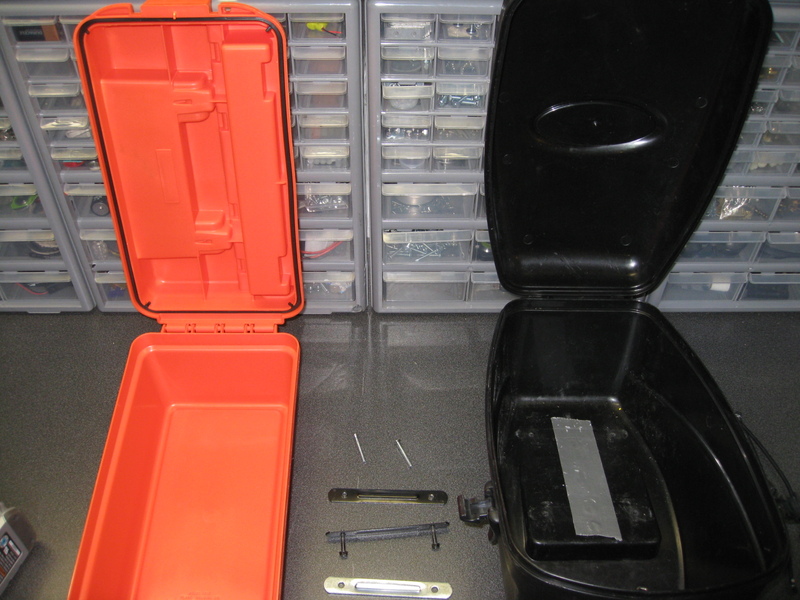 Plano Marine boxes on sale at WestMarine for $14.99, and comes in two larger sizes with same footprint -- you could have an "overniter" on the rear rack. You really wanted to match the Conti logo didn't you? Nice work - found your blog after I had already done a similar thing. I went ahead and drilled two 1/4" holes in my rack and then all I have to do is to drill holes spaced the same in my box (or cooler or anything else I want to mount) and then I hold them to the rack with two nylon bolts and wingnuts. Great ideas on your site, thanks for sharing.